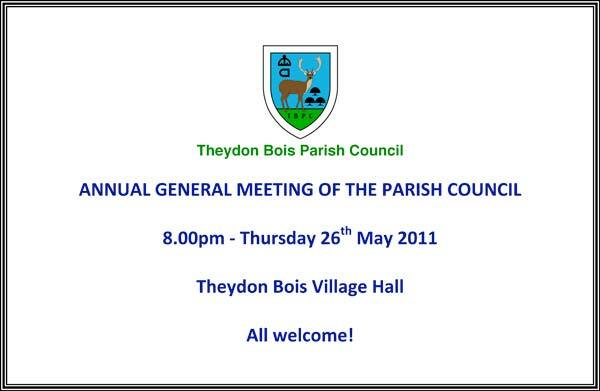 The Theydon Bois Village Design Statement is now nearer completion and the AGM of of the Association is being held next Monday the 27th June at 8.00pm in the Village Hall. All are welcome to come along and hear about how this important document will have to be considered by EFDC and developers who want to make changes in our village. The very popular Theydon Bois Donkey Derby takes place on Sunday 10th July. Gates Open 12 noon. First Race usually starts at 2.00pm. Last Race around 4.20pm. As well as the races there will be the usual variety of stands and side shows. Together this year with a Family Dog Show. Parking is available on the part of the Village Green opposite the event. 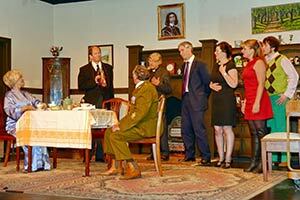 Our seniors enjoyed another afternoon of varied entertainment on Friday 17th June. While they sampled homemade tea and cakes made and served by our volunteer helpers they were able to watch a talented display of Country Dancing by Theydon Bois Folk Dance Club. 'Caller' Tricia Haslehurst led the dancers successfully through some very complicated routines and even persuaded Cllr. Sue Sowerby to join in for one or two 'sets'. There was some scratching of heads and conferring to identify the faces in the quiz that followed, but it seemed that most of the seniors were better than the volunteers at identifying the 'faces from the pst & present'. A very full afternoon was then rounded off with a Bingo session run by Cllr. Peter Hammond. 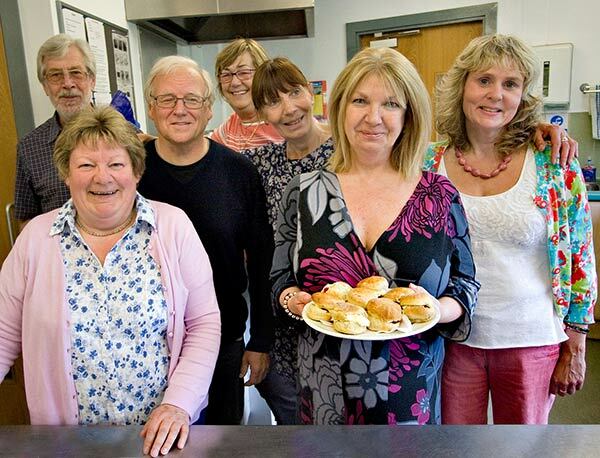 Some of the volunteers get ready to serve the homemade scones. 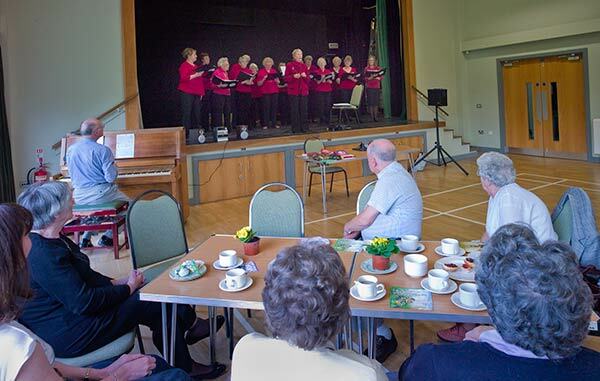 The next Theydon Seniors event will take place on Friday 23rd September between 3-5pm at the Village Hall and Loughton Ladies Choir will be providing the entertainment this time. 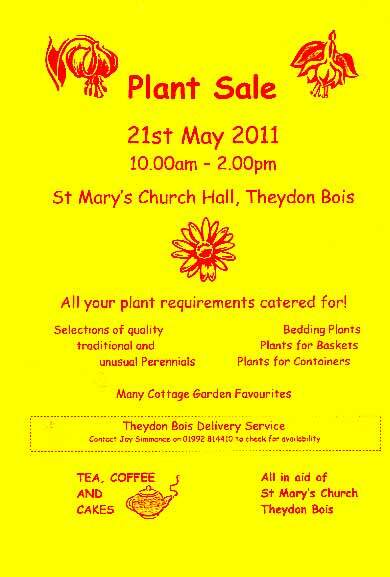 If you are interested in coming along or helping out as a volunteer at the event then please call Sally Crone, Parish Clerk on 01992 813442 to book your place or e-mail parishclerk@theydon.org.uk. Transport can be arranged if required. 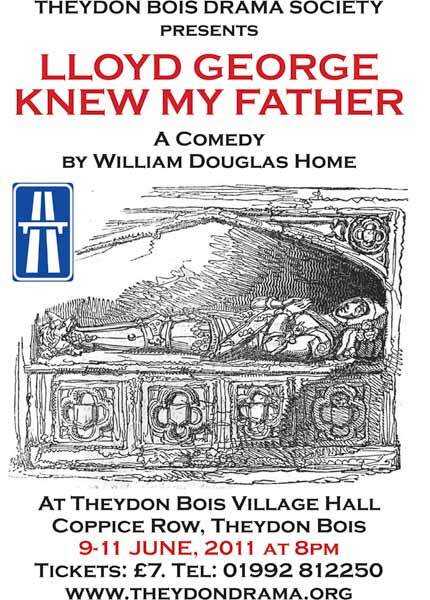 Theydon Bois Drama Society's production of 'Lloyd George Knew My Father' that ran in the village hall for 3 nights from the 9th to 11th June. 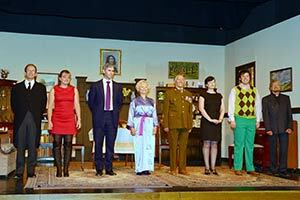 The Society again impressed the packed audience with their acting and production skills. The rain held off today and the sun came out as the Rev. Stephen Walker from St. Mary's Church cut the tape strung between the old and new Avenue of Oaks to mark the official opening of the new trees planting. This had followed a brief introduction by Parish Council Chairman Cllr. Sue Jones who thanked the City of London for planting the new avenue of trees and both the Theydon Bois Rural Preservation Society and Theydon Bois Horticultural Society who had contributed to the cost. Stephan Walker on opening the new avenue noted the importance of present generations making an investments now for those that will follow even if they themselves might not see the benefits. These trees now planted will probably not come to full maturity for another 50 years, but will be there so that they can eventually replace the original avenue allowing it to continue to be enjoyed by our descendants in the same manner that our fore bearers made that provision for us. The event was well attended with many children (of all ages!) 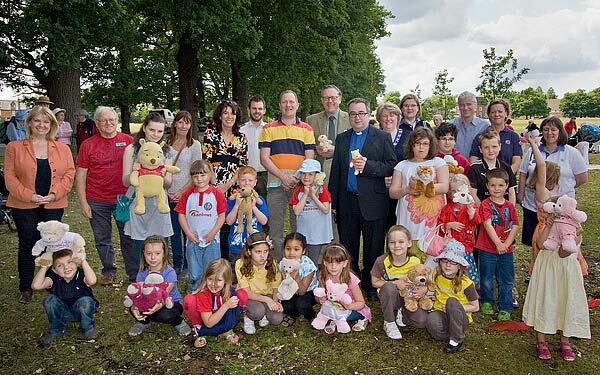 bringing their Teddy Bears for the Picnic that followed the opening ceremony. Xanthe Bearman of Tiny Mites entertained the crowd with songs and games while they enjoyed their food. The children were clearly enjoying themselves dancing to the music and singing along with Xanthe. Then its was time for tea and villagers made their way to the Village Hall to finish the afternoon enjoying tea and cake provided by the Parish Council. 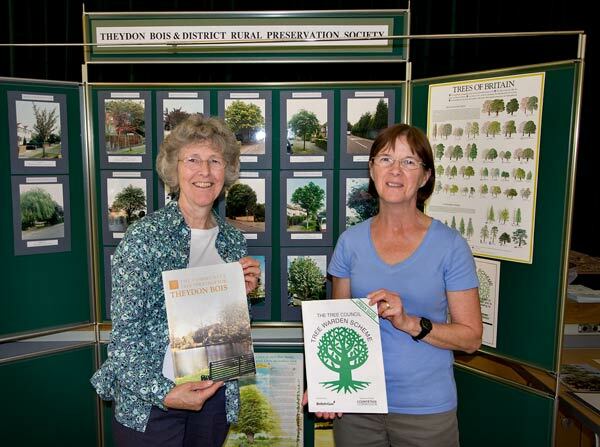 The Rural Preservation Society had put on an exhibition of photographs of significant trees in and around the village and our Tree Wardens Jane Turner and Sue Warren were on hand to answer questions about the trees. There is a fund raising/charity day on Friday 1st July at Theydon Bois Golf Course to raise money for the Cystic Fibrosis Trust and Help for Heroes. CF, is one of the UK's most common life-threatening inherited diseases and one which affects over 9,000 people in the UK. The Cystic Fibrosis Trust funds research to find an effective treatment for CF through gene therapy and through research, better understanding and treatment of Cystic Fibrosis, life expectancy is increasing. When the CF Trust was founded in 1964, a child was lucky to live over five years. Only half of those living with Cystic Fibrosis are likely to live past their late 30s - not good enough, but getting better. The basis of the charity day is 27 holes of golf, breakfast, lunch and dinner followed by a disco (I have attached a pdf of our poster). The price for the whole day and evening is £55 per person. If however golf is not your thing we are selling evening only tickets for £10 per person. We have some great prizes lined up and hopefully the weather will be kind. As you all know the Council is running this event on Saturday 11th June on the Green for villagers to mark the planting of the new avenue of trees. I hope you all have it in your diaries. 1. 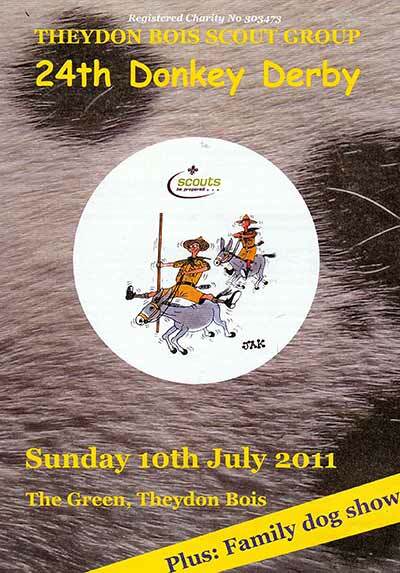 Brownies and Guides assembling on the Green 1.30pm onwards in uniform and will be requested to do some campfire songs. 2. 2pm Start – Short introduction and welcome by Parish Council Chairman, Councillor Jones. 3. 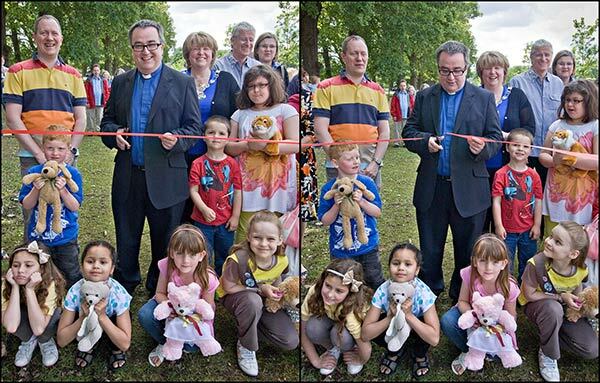 2.10pm Rev Stephen Walker to cut ribbon to be tied between an old and a new tree. 4. 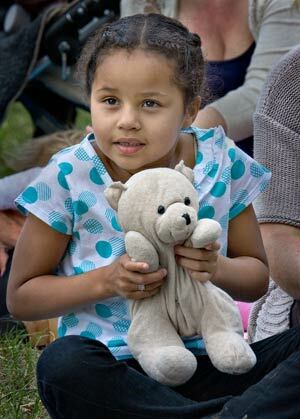 2.15-3.15pm DIY picnic on the Green with entertainment for the children provided by Xanthe Bearman (Tiny Mites which is a new business owned by a local resident which is running from the Community Centre). Xanthe has very kindly agreed to give her time free of charge. 5. 3.15pm – 4pm – Tea and Cake courtesy of the Parish Council in the Village Hall. The Rural Preservation Society is staging a photo exhibition from their archives for people to look at whilst at the Hall. All welcome and try and drag your friends (and their Teddies) along! Over the past three years when I have considered the Villager of the Year it has sometimes been disappointing that some people put forward do not actually qualify for the award which is governed by set criteria. I know this sentiment has been shared by my predecessors. After discussing this with my fellow councillors we have decided to introduce a new Community Award that is to be presented in recognition of any individual’s contribution to our community. 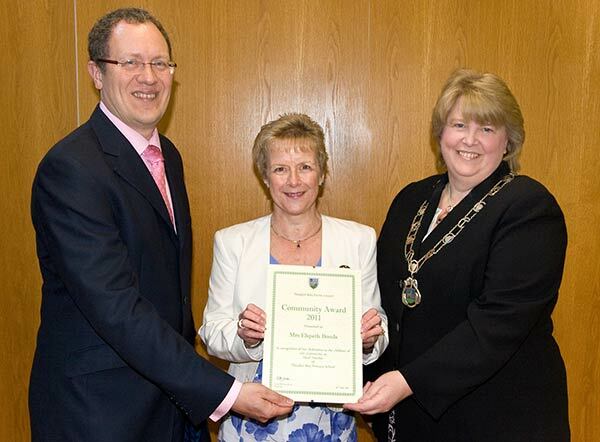 Today I am extremely proud to present the first two Community Awards. The first award is being presented to a young lady who has been prepared to commit time to trying to keep the youth of our village informed about events and activities through the village website. Our volunteer started working with the Newsdesk team as part of her Duke of Edinburgh Award but her involvement has gone well beyond the requirements of this. She started from scratch with the Youth Pages and working with the Newsdesk team and Cllr Mike Hannibal she worked extremely hard to get the pages up and running. She has attended our Newsdesk meetings when her studies have allowed and I am sure I speak on behalf of all the members of the tem when I say how impressed we have been by her contributions and ideas. 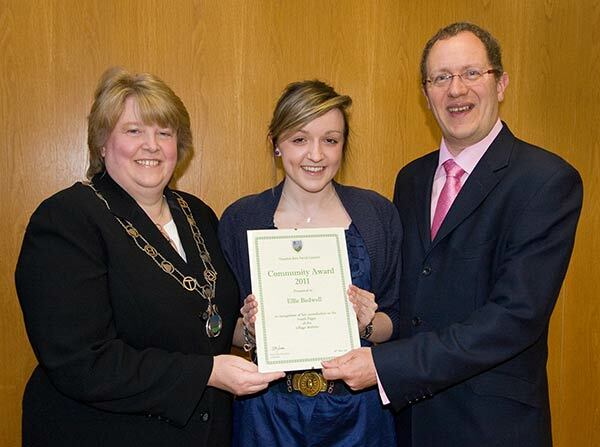 We are aware that she has really had to juggle her study commitments and the work on the website in the final build up to her exams in recent months but I am delighted that she has been able to take a break from revision to be here tonight and it is with great pleasure that I present this award to Ellie Bedwell. 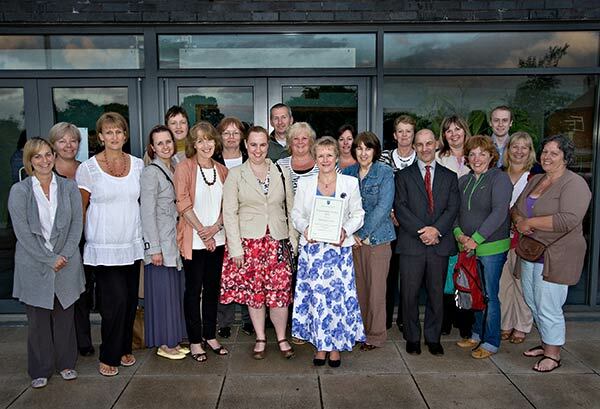 The recipient of our second award is extremely well known to many people in the village. She has been Head Teacher at our Primary school for thirteen years joining the staff there just six weeks before an OFSTED inspection. It was not the easiest of starts to a new job a somewhat adverse report meant that she was plunged into the deep end but despite this she set about reversing the school’s fortune with determination and single mindedness. It would be very easy here to talk at length about the many, many achievements that Elspeth worked towards and gained for the school and our children. However I would like to try and focus just a little on Elspeth as a person. I am not sure if it still there but Elspeth used to have a poster hanging on the back of her office door. It listed all the jobs that the modern Head is expected to perform, these ranged from Head of PR through social worker to chief tea maker and washer up! Elspeth plays all these roles with enthusiasm determination and dedication. The village children are all very lucky to be able to attend a school like They don. The Head Teacher leads her staff with a driving force, determined to get the best out of each and every child at the school. Her enthusiasm is boundless. Just one example of this was the recent wedding. Of course to the majority of us know the only wedding everyone is talking about is the Royal Wedding but not here in They don Bois, for any parent of a child at They don Primary there is only one wedding worth talking about and that is the alternative wedding held the day before in the School Hall. The key players were played by children with the same names as those playing the leading roles the following day. The bride was driven to school by an ex-chair of Governors and the service was taken by Sue Barclay out Baptist Minister in front of a congregation of pupils and staff each dressed in outfits fit for the occasion. But it did not stop here, after the service we all filed out onto the playground to watch the coupe emerge onto the balcony - they had draped purple fabric over the rear fire escape and the children cheered waving the flags they had made. Finally it was back in to the hall for a drink and cake and even a best man’s speech. It really was a fantastic occasion and illustrated that Elspeth never does anything ‘by halves’. The Head will I know be the first to acknowledge that she has only been able to achieve what she has through the hard work of her staff and I am really pleased to see many of them here tonight. I think it says a great deal about Elspeth that when I spoke to one of her deputies at 8.30 this morning they did not know anything about this evening’s event. Elspeth had not mentioned it to anyone. It is I think the only evidence one needs of the high regard her staff have of Elspeth that so many have put other arrangements to the side and are here to share this evening with her. Unfortunately Caller Pete Gooch, who was our representative on the Board of Governors for many years is unable to be here tonight so It gives me great pleasure to ask Cllr John Philip to join me to present this award to Elspeth Bonds. Now, on to the main award of the evening. Each year the Villager of the Year award is presented to a resident in recognition of the voluntary work they have done in our village which has made a major contribution to our community. I have just reflected on how fortunate our children are to have the education they do at our school but education and experience do not stop at the school gates. For many years the volunteers working with our youngsters through the Guide and Scout movements have made an invaluable contribution to our children’s lives. Often when I am talking to fellow councillors from other towns and parishes I hear comments such as ‘of course we used to have a guide company, brownie pack or scout troop but unfortunately we couldn’t get anyone to run it anymore.’ Not so in Theydon we have thriving groups representing, I think, every section of the Guide and Scout Association and this is all down to the leaders who put so much time into the groups. The time commitment is quite considerable, it is not just turning up for the weekly meetings but it is organising activities for these meetings and other outside events such as camps and jamborees. Even once the activities are planned there is still further time needed to find all the resources and equipment needed to ensure the children enjoy the meetings – no mean feat I am sure. 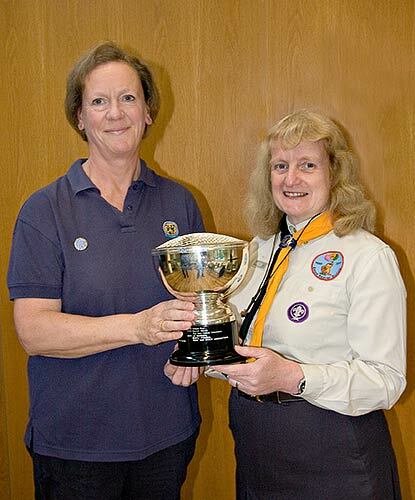 Again I know that there are others involved and once again it is teamwork that makes all this possible but there are two people in particular who have committed a tremendous amount of their time and energy over many, many years and I wanted to recognise their dedication to the groups and for all they have given to so many children, through the benefits of belonging to the Guide or Scout Movements over the years. I am very pleased to present The Villager of the Year Award for 2011 jointly to Liz Hannibal and Beryl Frankel. The latest issue of Village News (June 2011) shows four pages of photos of Villagers enjoying the street parties in celebration of William and Kate's Royal Wedding on the 20th May. As always with Village News space precludes us from showing more so we have added some further pictures here. Well the rain at arrived at last today, which must be a relief for our gardeners especially those preparing for Open Gardens Day on 26th June. This Spring has been noticeable for fluctuating (but usually warm) temperatures and dry weather which ensured Easter was the warmest and driest for several years. 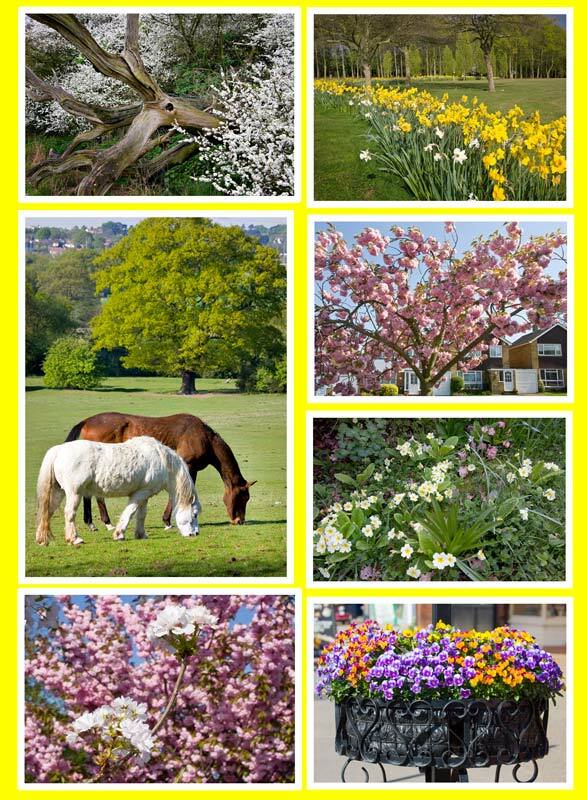 This weather helped the floral colours of spring to stay with us for some time in the village. Theydon resident Sue Warren took this picture at around 7am on a Tuesday morning May 11th. 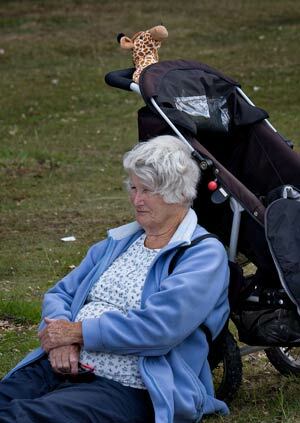 She told the Village Website “ I was just getting up & heard the hiss of the gas burners. I couldn't believe my eyes when I saw the first balloon - the basket apparently only just clearing the oak tree in my neighbours’ garden as it finally came to land behind our houses on the 7th Fairway of the golf course. It was even more amazing when a second balloon came over and did the same. Each basket carried around 10/12 people. The people got out and were all laughing and chatting and the balloons were soon deflated. A large jeep type vehicle with open back came and took the baskets/balloons away. 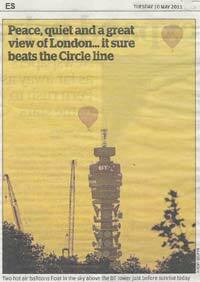 It seemed that the balloons were taking tourists on a pleasure flight over London as we saw a picture in the Evening Standard that evening taken earlier in the day"
Golf Club Manager David Bowles continued the story “We had had no advance notice of the landings but the story was that they had got into difficulty. Seemed that a party arrived from Indonesia on the Tuesday morning and were picked up at Heathrow and taken to Hyde Park where they boarded the balloons. They took flight and got in trouble and were forced to land at the Golf Club, on the 7th Fairway. Course Manager Jon was out on the course & went to the rescue. 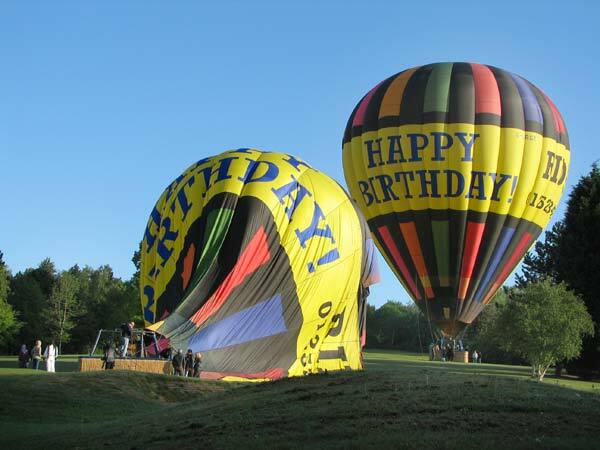 He then met two land rovers in the car park which came on to the course to collect the balloons and guests. There was no damage to the course. The guests were taken to TB Tube Station got the tube to Heathrow & went back to Indonesia!!! On 11th May a new Indian Restaurant opened in Theydon with Parish Council Chairman Sue Jones cutting the traditional ribbon . It’s called Salaam Namaste which is a traditional Indian welcome and can be broadly translated as “Hello - May Peace be Upon You”. Salaam Namaste Says "our mission is to be the best Indian restaurant in Greater Essex; at Salaam Namaste we take pride in providing a unique dining experience to every guest by serving innovative Indian cuisine. 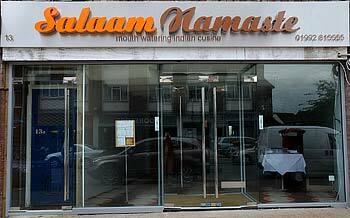 www.salaamnamasteepping.co.uk/ or it can be reached via their entry on Our Eats & Drinks Pages. Salaam Namaste joins the Theydon Balti House and Indian Ocean as the third Indian Restaurant in Theydon Bois, but each offer their own particular style of Indian Cuisine. 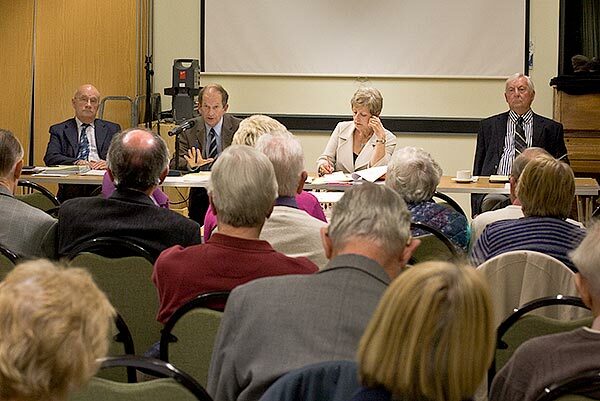 This is the Annual General meeting for Parish Council business as distinct from the informal yearly Annual Meeting that took place on the 11th May (see below). All villagers are of course entitled to attend and are most welcome. 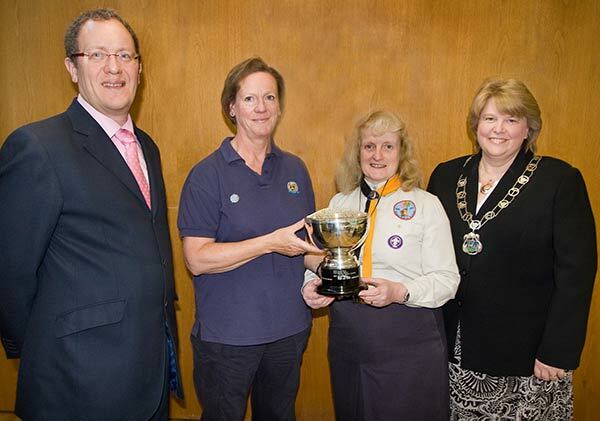 Please note that before the start of the Meeting the Chairman will announce the winner of this year’s annual award of the Theydon Bois Community Rose Bowl to the Villager of the Year and will make presentation of this and other Chairman’s Community Awards. Come along to find out who are this years very worthy recipients. The full meeting Agenda is here. On Wednesday evening (11th May) the Parish Council held its Annual Meeting to inform villagers about the achievements of the last year and future projects planned for our village. The format of the meeting was that adopted last year with refreshments and the opportunity to chat informally with councillors from 7.30pm and then the presentations by councillors following at 8.00pm. The number of villagers attending the meeting was a little disappointing, but those who did attend came away better informed about the hard work put in by our Parish Councillors and Council Staff. Below is a brief video of the evening. 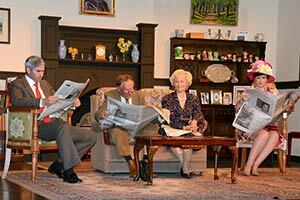 a comedy by William Douglas Home. When Lady Sheila Boothroyd learns that the government is set on building a bypass through the grounds of her ancestral home, she announces her decision to kill herself at the precise moment the bulldozers move in. 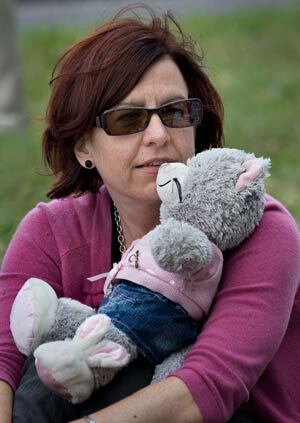 At first disbelieving, her family realise to their horror that this is no joke. As the hour approaches, will the redoubtable lady carry out her threat? 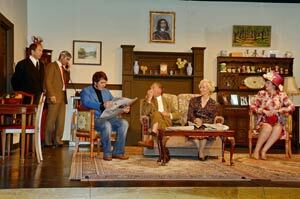 Performances will be at the Village Hall on Thursday June 9, Friday June 10 and Saturday June 11 at 8pm. Tickets are priced at £7 and can be booked from Graham and Carol James on 01992 812250 from Tuesday May 10. The Society's autumn production will run from October 27-29 and is Pygmalion - The classic story of Eliza Doolittle and Professor Higgins by George Bernard Shaw. When the City of London planted the new Avenue of Oak Trees the held a small a event to mark the planting as this was in November when the weather was best for planting the oaks, but poor for a wider celebration the Parish Council promised a ‘Proper Inauguration and Celebration of the New Avenue of Oaks’ in an event to be enjoyed by all villagers in the summer of 2011. 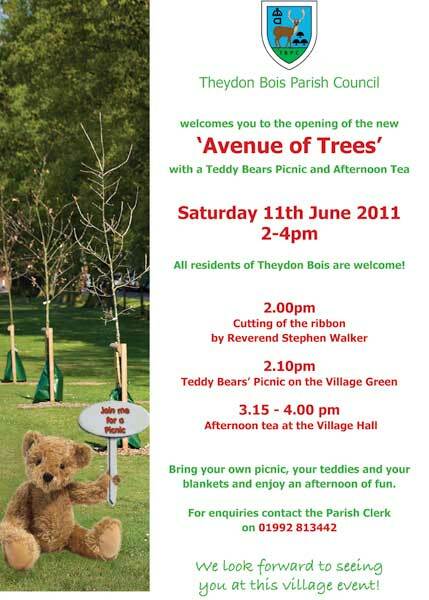 This is now scheduled for Saturday 11th June and will take the form of a fun Teddy Bear's Picnic on the Village Green to be followed by the Parish Council's invitation to afternoon tea in the Village Hall where the Rural Preservation Society hope to put on an exhibition of photographs of trees in the village. All villagers and Teddies are welcome, so come along. 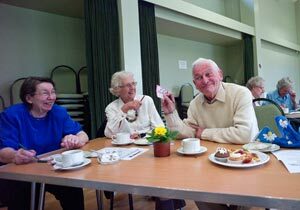 Our Theydon Seniors events have gone from strength to strength and have become a ‘must have’ within our Theydon Seniors’ social diaries. The Parish Council run these popular events every quarter and these are open to all senior village residents and particularly those who are less mobile or those who enjoy socialising with like-minded people. We like to vary our entertainment and in the past year our senior residents have been entertained by the Pearly Queen of Redbridge, the Crofton Singers, the children of Theydon Bois Primary School, students from the Davenant Foundation School and our latest event in March included an excellent local group called ‘Singing 4 Fun’. Our next event takes place on Friday 17th June from 3-5pm when we will be organising a Summer afternoon tea and a display of Country Dancing. Transport to the Village Hall can be organised in advance and interested residents just need to register their interest to attend through by phoning (01992 813442) or e-mailing Sally, the Parish Clerk. 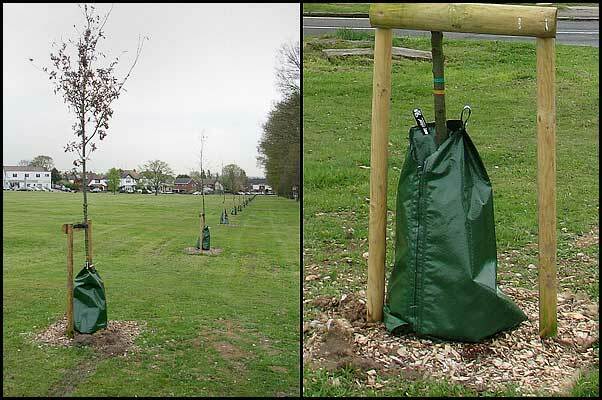 Villagers may have noticed the green 'bags' which have appeared around the base of each of the 50 new oak trees on the village green The City of London contractors fitted the 'Treegator' irrigation bags on 13th April. They are designed to deliver 75 litres of water over a 5 to 9 hour period. This will make watering the trees in very dry weather a much easier and more efficient job. A Loughton Festival event that might interest villagers. 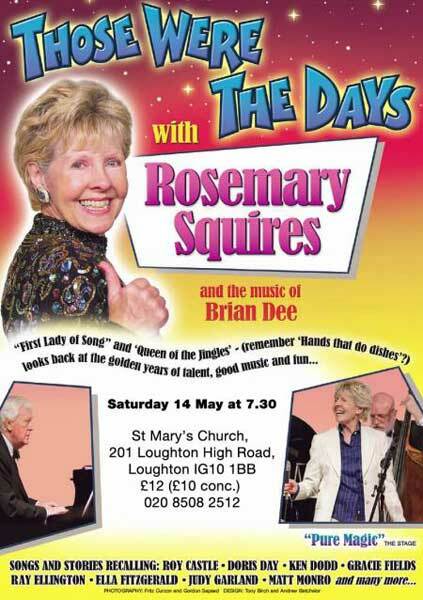 Rosemary Squires will be performing here in Loughton. She will be well remembered by many villagers as she was often on TV (not to be confused with Dorothy Squires). We will be raising money for Guide Dogs at this event with a raffle / retiring collection and if any of you would like to donate a prize to help this cause, we would be delighted to receive it. VA Chairman Martin Oliver (2nd from left) answers a question from the audience. Epping Forest District Council are warning local residents about door-to-door canvassers and cold telephone callers selling home insulation who falsely claim they are working for the Council backed scheme Herts Essex Energy Partnership (HEEP). "We have recently had some concerns from residents who have repeatedly received cold telephone calls or door-to-door canvassers falsely claiming they work for the council approved HEEP scheme, selling loft and cavity wall insulation. These canvassers and cold callers do not work for the HEEP scheme. Approved canvassers on the HEEP scheme will always carry identification and branded paperwork and are approved by the Council. If residents would like to speak with a HEEP advisor about funding available to help them save energy at home, or to book a free no obligation survey by a council approved installer, they can call HEEP free on 0800 980 6026." Epping Forest District Council are part of the HEEP scheme along with 14 other Councils across Hertfordshire and some parts of Essex. Under HEEP residents can benefit from loft insulation for just £148, or FREE if they are on certain benefits or over the age of 70*. Insulation is incredibly cost effective. Installed separately loft insulation can save around £145 and cavity wall insulation can save around £110 every year. ** Without funding loft and cavity wall insulation can cost around £250 each. To find out more call the HEEP scheme free on 0800 980 6026 to speak with an expert energy advisor. It is over 5 years since the Enforcement Notices requiring the restoration of the Blunts Farm Site to something approaching its former 'Green Belt' state. These notices were applied following the debacle over the proposed Golf Course that were issued. During that time the Theydon Bois Preservation Society, the Parish Council, TBAG and many individual villagers backed by MP Eleanor Lang have kept up the pressure to have the land properly restored to something approaching its previous rural aspect. In January this year planning officers initially considered signing of the notices and that proposal came before the EFDC District Development Control Committee on 5th April. Following the speeches made on the night by Peter Newton the Rural Preservation Society's Chairman and the Parish Council Clerk, Sally Crone EFDC Councillors on the District Development Control Committee agreed that the Enforcement Notices on Blunts Farm should not only not be signed off, but that before the issue is given further consideration and then only after officers feel the land is fully restored to the best that we can all hope for, a site visit is undertaken by councillors themselves. To view the EFDC Webcast of the debate follow the link and go to Index Point 14. The Rural Preservation Society's 2011 series of Monthly Guided Walks from Theydon 'kicked off' on 3rd April with the walk "Tracks - Past & Present" led by the Society's Chairman Peter Newton who again amazed walkers with his knowledge of the local area. Again this year the walks are proving very popular with both old and new members of the village community attending as well as visitors from farther afield who have found information on the walks here on the Website. 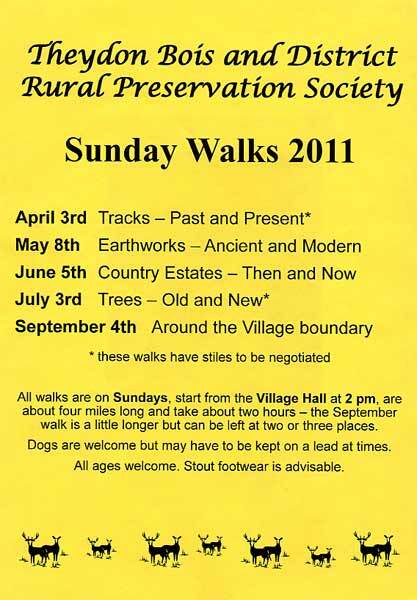 The next walk is on May 8th and the full list for 2011 can be seen below. TB&DRPS WALK 01: Tracks - Past & Present. 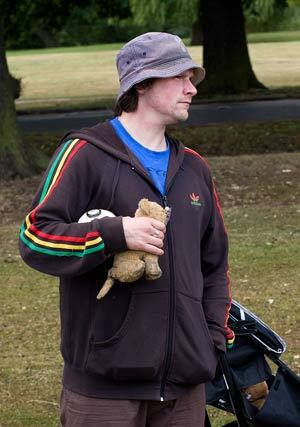 (This was the walk of Sunday 3rd April 2011). TB&DRPS WALK 02: Earthworks - Ancient & Modern. (The next walk on 8th May). You are welcome to use these as an accompanying guide to the Society's walks or to try the walk 'under your own steam'. A heroes themed woodland walk through Epping Forest on Saturday 14th May, with interactive fun along the way. We need you to come along and take part in this charming event and help raise money for Haven House Children’s Hospice. An ideal family day out followed by entertainment in the beautiful grounds of the hospice…and all for a very important cause! Be one of the first this century to travel to High Beach by bus! Bus 845, the new Sunday service fully accessible shuttle bus will be running throughout the summer between Loughton Station, High Beach and Chingford Station. In addition, and as long as it is safe to do so, the bus will stop along the route when it is hailed. It started at 9.30am last Sunday 3rd April and the first bus was greeted it when it arrived at High Beach on its inaugural journey with music supplied by a local piper. It was also met at by Epping Forest chaplain, Gill Hopkins, who blessed the bus before leading her congregation to High Beach church. For those present this a better way to celebrate Mothering Sunday with a trip to the Forest by bus. Tell one, tell all - the heart of Epping Forest just got easier to reach! 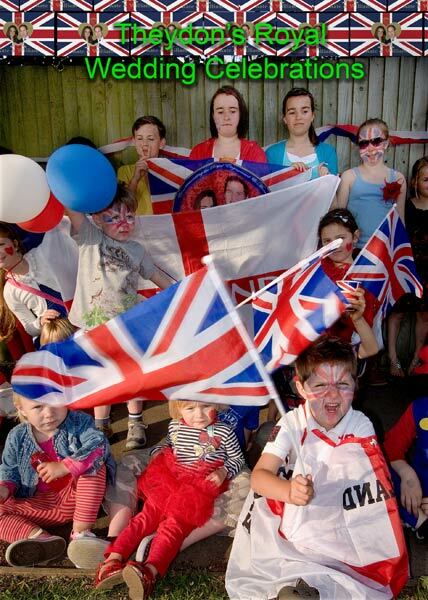 Essex County Council has set up a new community group on Facebook for residents to share their plans for Royal Wedding street parties. The new group has been set up us a forum for party planners to spread the word about their celebrations, share tips and ideas, and chat about what makes a good street party. "We really want to hear how Essex residents are showing their community spirit and making the Royal Wedding a memorable occasion for everyone. We’d love to hear from everyone who is organising a street party in Essex, however big or small, so please join the discussion and let us know what you have planned!" 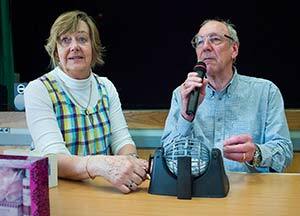 The afternoon of Friday 25th March marked the occasion for another successful Theydon Seniors event – and the first one for 2011. Parish Councillors and volunteers ensured our senior residents enjoyed every second of the event by organising afternoon tea and homemade cakes as well as the opportunity to listen to the excellent singing group ‘Singing 4 Fun’. The afternoon was rounded off with a few games of bingo and a range of prizes. The Theydon Seniors quarterly events are becoming ever more popular and our elderly folk really do look forward to a couple of hours of conversation and entertainment in friendly surroundings. 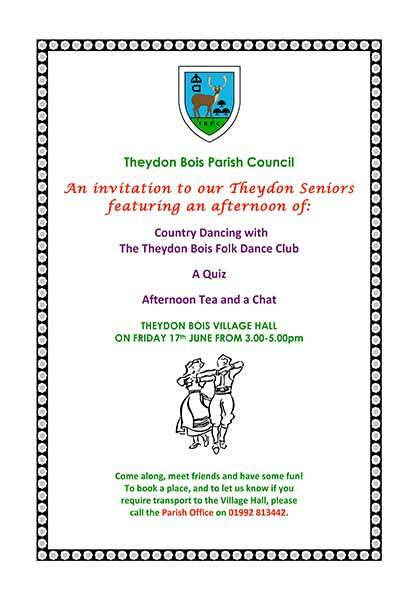 The next Theydon Seniors event will take place on Friday 17th June between 3-5pm at the Village Hall. If you are interested in coming along, please call Sally Crone, Parish Clerk on 01992 813442 to book your place or e-mail parishclerk@theydon.org.uk. Transport can be arranged if required. 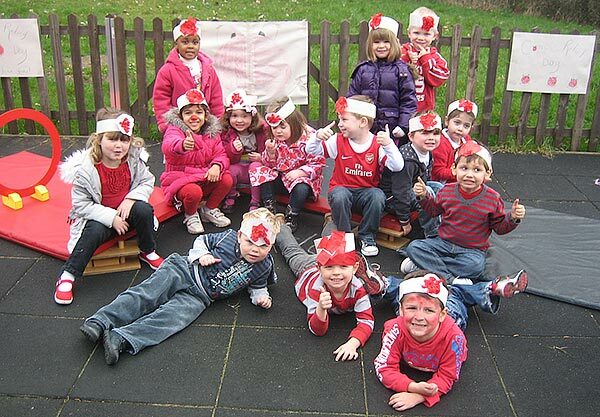 The children at the Village Montessori Nursery had an exciting time during Comic Relief week. They learnt at Circle Times about the serious side of Comic Relief and how any money they raised would be used to help children living in poverty in Africa. On a lighter note, the children had lots of fun making “Red Nose” hats and “Red Nose” biscuits. Not to be outdone, their parents participated in the Comic Relief Poster sweepstake, with a prize of £30 to be had. As their main event, the children asked family and friends to sponsor them to complete an Obstacle Course set up in the playground and on the day proudly wore their Red Nose hats as they performed each activity. They jumped and hopped along a Hopscotch mat, walked along balance beams, crawled through a hoop, jumped along a line of hoops, crawled through a tunnel, negotiated a slalom course by either bouncing on a space hopper, pedalling a tricycle or pushing a wheelbarrow, and finished by throwing beanbags into a bucket from a distance. Staff ensured that the children completed each activity by monitoring the different stations. The children, ranging from 2:4 months to 4½ years, were full of enthusiasm throughout and were eager to go around the course again, although they were only sponsored to complete each activity just once! Needless to say, the children had a wonderful time and were very proud of their efforts, especially as together they have raised £403.90 for the charity. The Annual General Meeting of the Village Association takes place on Wednesday 13th April and all villagers are welcome to attend. It is likely that this year the most important topic for the meeting will be the request from Vodaphone/02 to the the Trustees of the Village Association (which are responsible for the management of the Village Hall) for their permission to erect a mobile phone mast in the grounds of the hall which are owned by the Official Custodian for Charities. The VA informed residents in the March edition of the Village News that: ‘The Village Hall Executive has received a request from Vodaphone/02 to erect a telecoms base station and mast for mobile phones in the Village Hall grounds. This has been discussed in Committee and more information is being sought. No decision will be taken until a thorough consultation has taken place. ’ Vodaphone/O2 will be giving a short presentation to the VA Trustees at their AGM, but no decision will be made at the AGM this will be made at a subsequent Trustees Meeting. Further consultation will then be presentation with a question and answer session will be held at a later date and this will be open to all villagers. Masts or poles that are more than 15 metres high require planning permission. Masts or poles that are 15 metres or below are permitted development, but still require permission from the Local Authority (EFDC) with regard to siting and appearance of any installation. The offer from Vodaphone/02 is likely to substantially increase the Village Association's annual income from the mast site rental, but a number of groups in the village have already expressed opposition to the siting of the mast. At present there are 3 masts already located around the village and recently the Buxton Trust were also approached to locate a mast on the sports field off Loughton Lane but refused the offer. The Loughton Festival was conceived in 2006 and has grown from a weekend in March to a festival that starts in mid-March and ends in May. Events for 2011 kick off with The Loughton Youth Music Festival on the 23rd March at 7.30pm. and the venue is Loughton Methodist Church, 260 High Road, Loughton. The full programme is available from the Loughton Festival Website. Theydon Bois Community and Youth Centre. The Full Agenda is available as a PDF. We now confirmed that the entertainment for the Seniors Event listed below is the singing group called ‘Singing 4 Fun’ lead by Jenn Creswell. Further Seniors Events for 2011 will take place on the following dates: 17th June, 23rd September & 25th November. Details and bookings please call Sally Crone, Parish Clerk on 01992 813442. The Village Web Site Editor apologies to contributors and visitors for the lack of updates over the last few months. This site is run on a voluntary basis by the editor and unfortunately due to personal circumstances he has been unable to find time to keep the site up to date. He is now in the process of updating the pages and it is hoped that the site will be fully up to date shortly. After a very successful ‘festive’ event which was held in late November, members of the Parish Council and Volunteers have a lot to live up to for our next event, which will take place on Friday 25th March between 2.00-4.00pm. We look forward to seeing as many of our senior residents as possible. To register your interest in attending our next Theydon Seniors event.